Many of you were hit with a cyclone bomb with wild blizzards and terrible flooding. We are sorry to hear of the destruction that the storm left in its wake especially for those of you in Nebraska. We have been encouraged by the stories we have heard about how people are pulling together to help each other. Please know you are in our prayers. 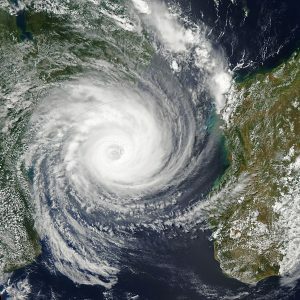 At about the same time, Africa was also hit with a terrible Category 3 cyclone. Cylcone Idai hit Mozambique on March 14th but it also affected the countries of Malawi and Zimbabwe with storms and flooding. South Africa even had some power outtages due to Idai. This storm came out of no where and no one was prepared for it. The official count so far is about 1000 dead but so many are missing that we may never know how many people died in the floods. Searches for missing people have been called off so they can care for the living. Cylcone Idai destroyed about 100,000 homes, about 1 million acres of crops, and washed out many roads. People in the port town of Beira in Mozambique were clinging to rooftops and trees even a week after the storm hit. People are struggling to find food, clean water, and shelter. To make matters worse, cholera has spread among the crowded survivors. 1400 cases have popped up in the last week. Rescue workers and relief organizations have flocked in to help but there is so much need and not enough help. TWR’s shortwave and AM broadcasts have not been disturbed as we broadcast from Swaziland. We are still sending out a message of hope to our listeners who desperately need to hear it in their time of despair. Pray that our listeners will hear the hope that is found in Jesus and will turn to him. Some of our local ladies who are a part of our Women of Hope ministry have started a collection of blankets, clothing, non-perishable food, and money to send to other Women of Hope groups in Mozambique.